I am having my morning coffee while munching on this Thank You Berry Munch girl scout cookies. This is one of the new flavors they have. These cookies are made with real cranberries. Another favorite of mine on their new flavors is their lemon cookies called Savannah Smiles. I love to see wildlife around my home, although there really isn't enough in my neighborhood for my opinion. But I guess that I shouldn't be surprised because I don't live in the wilderness or anything like that. But it doesn't hurt to try and attract some little cute birds to our home to watch and enjoy. So I thought it might be fun to try and make a birdhouse by myself so that I could attract some birds to look at. Making a birdhouse is something that I've never tackled before, though. I looked online to find some easy birdhouse directions I could follow and ran across the site debtcounseling.bankrupt.com/. I read through it some and after that I decided to use it to help get some counseling for my debt. I did find the perfect little tutorial for a birdhouse that I wanted to try out for myself. So I'm going to give it a go and hope that it actually attracts some birds and will give me a little more wildlife to look at from my front porch! and this is what probably be our lunch again since it is a no meat friday. 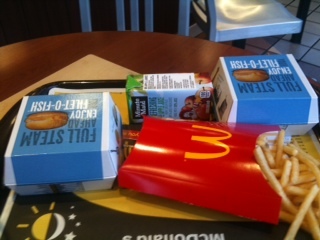 The fillet o fish is still 2 for $3! But even if it is not lent, i always have fillet o fish when i am in mickie dees. Pair this with a large brewed tea and lunch is all done. Mega million is up to $540 million. Good luck guys. Gift baskets are offerings that can make anyone happy. The items put in the baskets speak what type of person is giving the basket. Hence, adding a bottle of wine will add a touch of class to the entire basket. The choice of wines also plays an important role in the quality of wine baskets that you are going to give. It is best to order your wine baskets online when the recipients live far from you. So, you do not have to go through the trouble of packing the gift. Ordering online includes delivering your gift to your recipient in a timely manner, and the online vendor will take care of everything for you. For people who love wines, they will surely enjoy making wine gift baskets. The personal touch of putting all the items together on your own will make the basket very exceptional and unique. In order to make the wine basket a very personal one, you have to make sure that you know the favorite wine of the recipients. This is to make the recipient very happy because this means you pay attention to their favorite. The most important aspect when creating a wine basket is the basket itself. It should be sturdy enough to hold the bottle of wine and keep it in place. A sturdy basket is needed in order to avoid undesired accidents. Straws should be spread at the bottom or base of the basket in order to serve as a cushion and protect the wine bottle. You should find the perfect wine for the recipient of the wine basket. Once you have selected the wine, you can choose other items that can be included to your basket. In order to make a good wine basket, you have to be creative. You can choose anything you want to include in the basket. You can add items that are practical or for oneâ€™s hobbies such as books on wines. Most people love cheese to go along with cheese. Thus, add some of the favorite cheese of the recipient in the wine basket that you will create. You recipient will surely appreciate the wine basket some more. When creating wine gift baskets, moderation is the key. It is important not to drown your wine in a basket filled with a mess. A basket that is full of crammed items will only look overwhelming. Your recipient will have a hard time appreciating the gift. Thus, balance the number of items you include in the basket. There is no need to overload your basket. You just have to keep it minimal and add your stylish touch. These are the different treats we had last Valentine's Day. We did not go out for dinner that day because it was a weekday and for sure the restaurants were packed. Hubby took charge of the kitchen so that was sweeter than anything else. He also ordered food to take home instead of dining out. It was a quiet and relaxing day at my house. Hubby's valentine gift to us and also our gift to Isabella. Heart decorated cookies at my job. The ladies got this yummy dessert from one of our male employees. My daughter so happy with her big bar of chocolate. Her valentine gift from Papa.